I love working with Annie Sloan Chalk Paint. 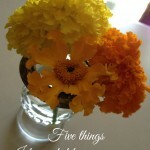 The colors are beautiful and it’s so easy just to open a can of paint and paint away. 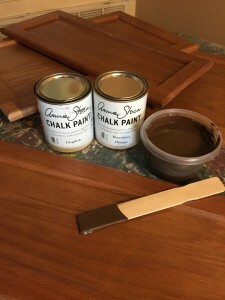 Transforming pieces of furniture or any craft project is super easy and the colors are rich and silky but there are times I just need a color that isn’t available right out of the can. It is absolutely amazing how easy it is to create 100’s of other colors by mixing a few of the 31 colors in the Annie Sloan color palette. 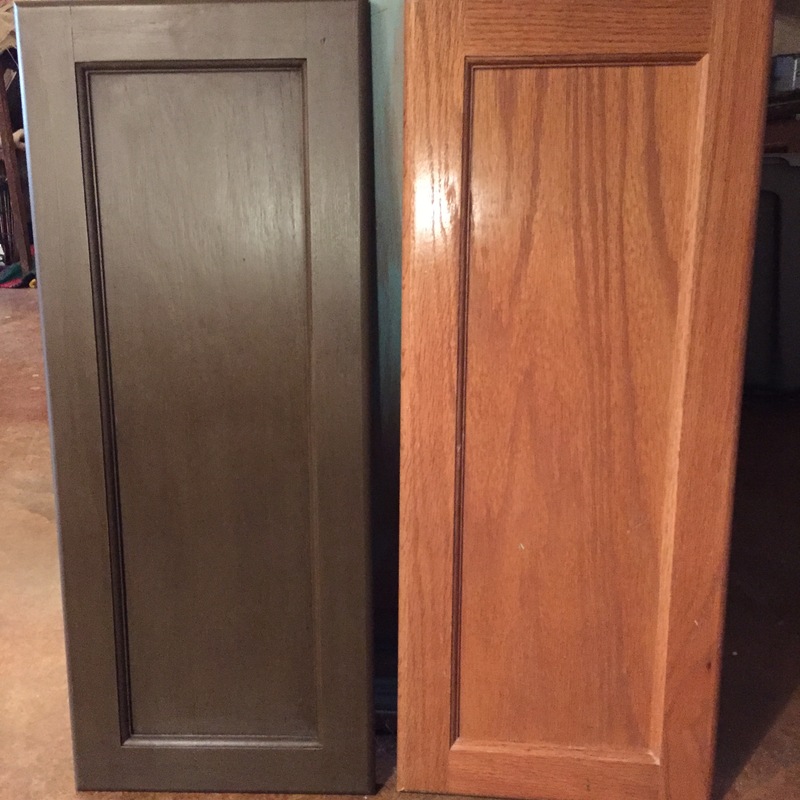 For this project I wanted to turn our generic builder grade cabinets into a dark chocolate brown. 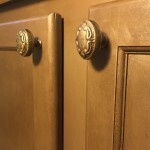 Our cabinets have real wood doors but a laminate material on the rest of the cabinet. I don’t think a gel stain would work over that laminate and to use latex paint I would have to sand and prime each surface. 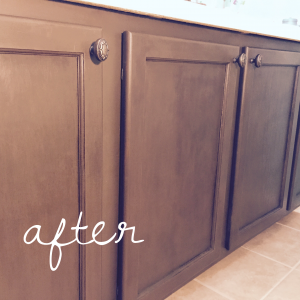 Annie Sloan Chalk Paint saves the day in this situation. No sanding, no prepping and no glazing before painting. 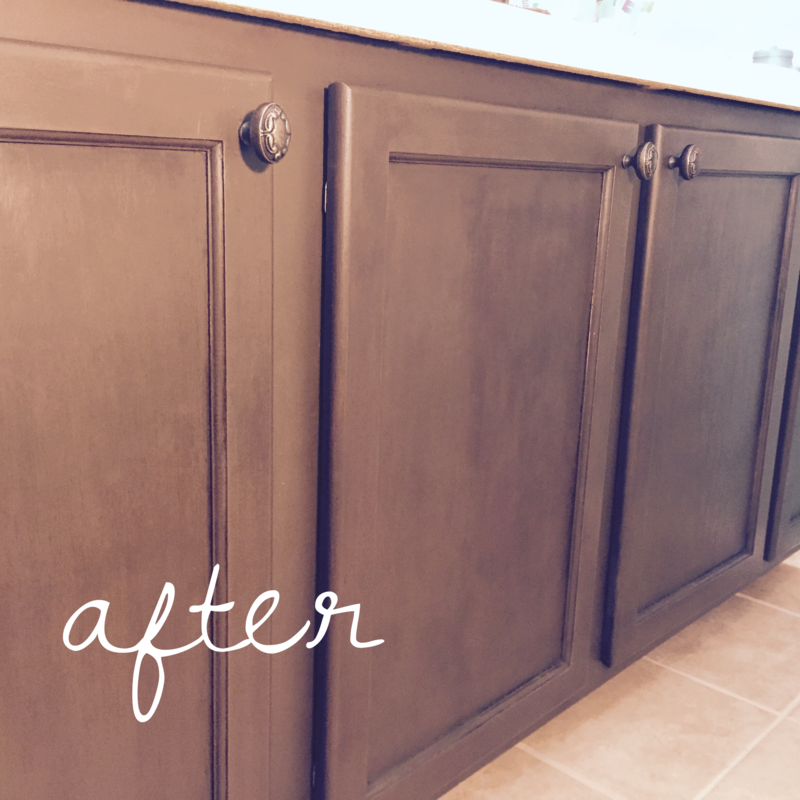 All you have to do is clean your cabinets prior to painting them and presto you are ready to go! The recipe to create a this custom dark chocolate brown with Annie Sloan Chalk Paint. Use equal parts of Barcelona Orange and Graphite in a container that can easily be covered and allows for complete mixing of the paints. You don’t want to use containers that have ridges or corners because it will be near impossible to completely mix the two paint colors together. You also want to make sure you can cover and seal the container you are using so no air can get into the container. This will keep any left over paint from drying out. One of the most important steps of this process to achieve the rich chocolate color is using the Annie Sloan Dark Soft Wax. This is one time that I would skip using the Annie Sloan Clear Soft Wax first. 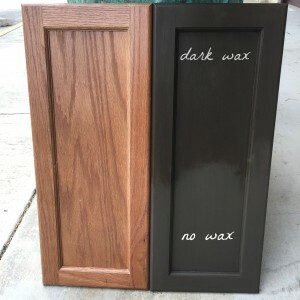 By using the dark wax you are able to create a rich deep color that is truly beautiful. In this picture you can see the top half of the painted cabinet is much darker than the bottom half. The top has been waxed with the dark wax and the bottom of the cabinet has no wax applied on it. 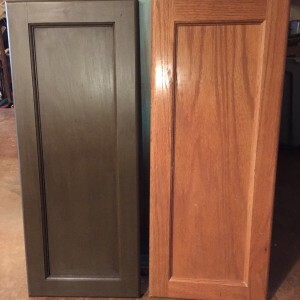 First I painted two coats of my Annie Sloan custom color dark chocolate brown paint and then applied one coat of Annie Sloan Dark Wax. I added new hardware as the final touch and I LOVE the new look! I picked up the hardware at Hobby Lobby on a 50% sale. SCORE! It took me about 2 hours to complete this project and I cannot be happier. The color is a deep rich brown color which is exactly what I wanted. 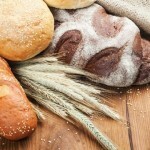 The cabinets are updated and have a professional look and feel. The hubby loves them too! What do you think? What custom color would you like to create with Annie Sloan Chalk Paint?